I love adventure stories, particularly when they have, as the best ones do, an in-built reminder about the transformative power of wild places. 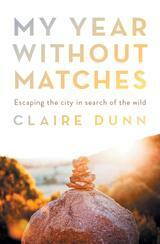 While I was in "my" cabin in Norway recently, I read My Year Without Matches: Escaping the City in Search of the Wild by Claire Dunn. And, without gushing too much, it's my new all-time favourite book. 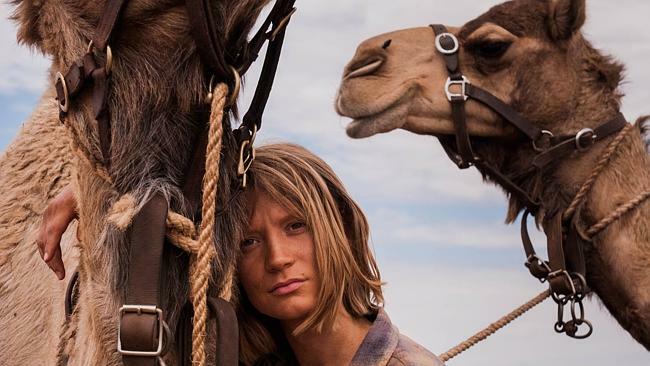 I probably would have loved My Year Without Matches for its subject matter alone: solo woman spends a year in the Australian bush and, as well as learning survival skills, finds the wildness in herself. 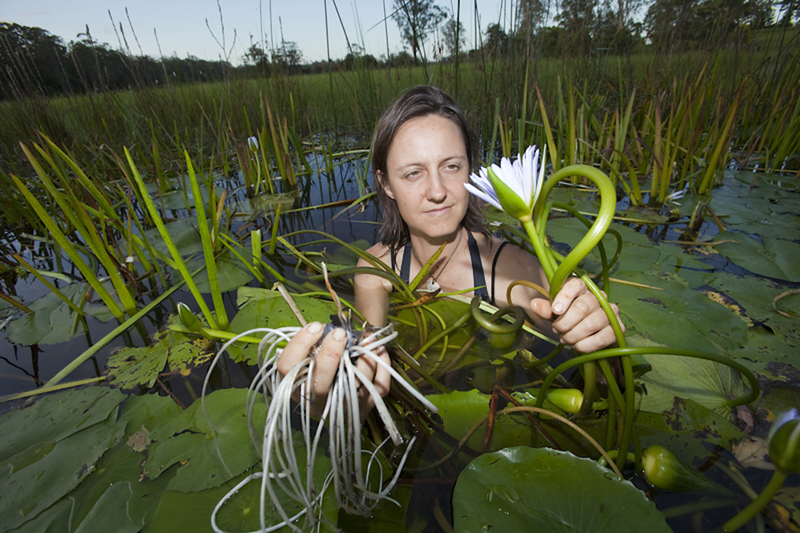 A bit of background: Burned out by her work as an environmental campaigner, Claire joined an experimental, year-long Wilderness Studies Program on a 100-acre block of bushland halfway between Grafton and Coffs Harbour on the NSW north coast. 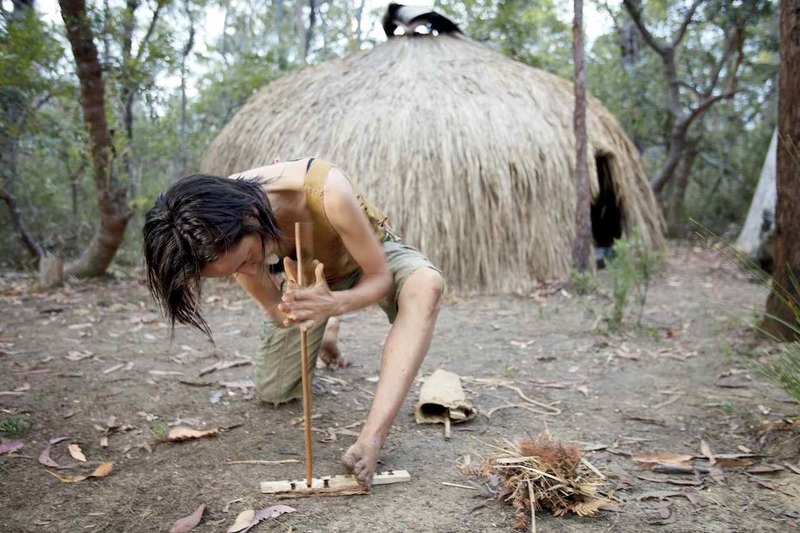 For six months, she and five others learned how to build their own shelters, make baskets and pots, understand bird-talk, track animals, find bush tucker and, most critically, make fire with sticks. Then they had six months to apply these skills. But what I really loved about My Year Without Matches is Claire's luminous and vividly clear writing. There are so many well-observed and beautifully described details you feel as if you're right there with her, as barefoot and wild-haired as she was. And I'm not the only one: the book has had an incredible reception worldwide, which Claire puts down to a "hunger for intimacy with the wild, and for wildness in ourselves". A couple of weeks ago, I got to meet Claire in Newcastle, where she now lives - in a house, though she often still sleeps on the floor in her swag. We spent one of the loveliest afternoons I can remember, swimming, hanging out by the beach and talking. What inspired you to spend a year in the bush? I think the seed was planted quite a long time ago when I read Robyn Davidson’s Tracks in my early 20s [Claire's now 35] and that really spoke to me – just the experiences she describes of the spaciousness and the rawness of being in the desert, and confronting parts of herself that she never knew existed, and the sense of empowerment that can come from those kinds of challenges. Also I felt intrigued by what it would be like to be alone in that vast landscape and what that could do to you, for you, how it could transform you. What did you miss most, out there? In summer, air-conditioning! When it was cold, anything hot - kettles, hot water bottles. I missed my friends and family. And matches - though that was the challenge I'd set myself, could I live without matches for a year? And simple things like walking down the street, getting a chai latte and reading the paper. But in the end I loved the things I had during that year more than the things I missed. I didn't expect to love my shelter so much but I really did. It was my friend, my ally, my confidant. It was where I felt safe. I loved my sit-spot [where Claire sat for an hour a day, just listening and taking in her surroundings] - it was like a doorway into this magical land. I was mad with curiosity, so I would hear or see things then want to know: What was that? Where do birds go when it rains? 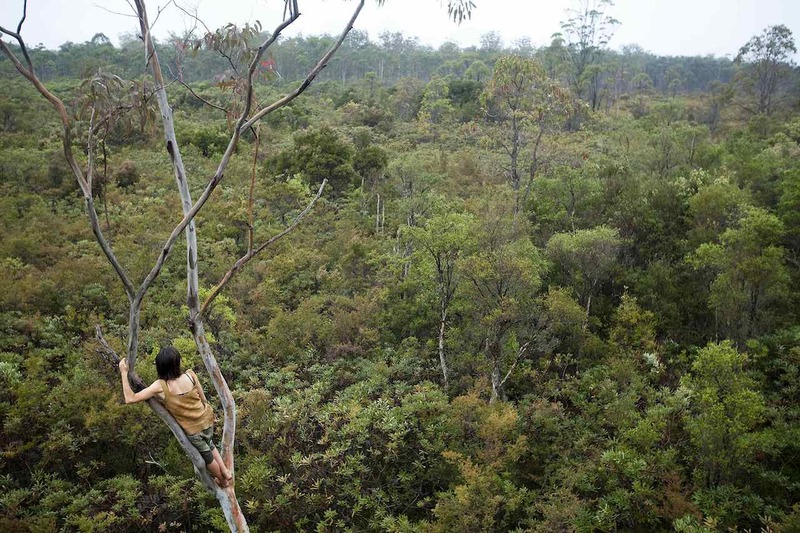 And [despite being a forest campaigner for The Wilderness Society for many years] I wasn't ready for how much I'd fall in love with the forest. Did you have any home comforts? I had toothpaste and a toothbrush, a few knives, a mosquito net. But I survived without soap and shampoo (my hair got really shiny from the tannins in the river) and I never wore sunscreen or moisturiser; I didn't have a mirror either. In fact, another thing I loved was getting into camouflage: smearing mud on my face and arms and legs, adding leaf litter, it was like putting on a costume, then becoming invisible; it really makes you feel close to the earth like nothing else. A year in nature sounds so simple - was it? Before I went, I did picture myself having a very simple time and wondered: how am I going to fill an entire year? 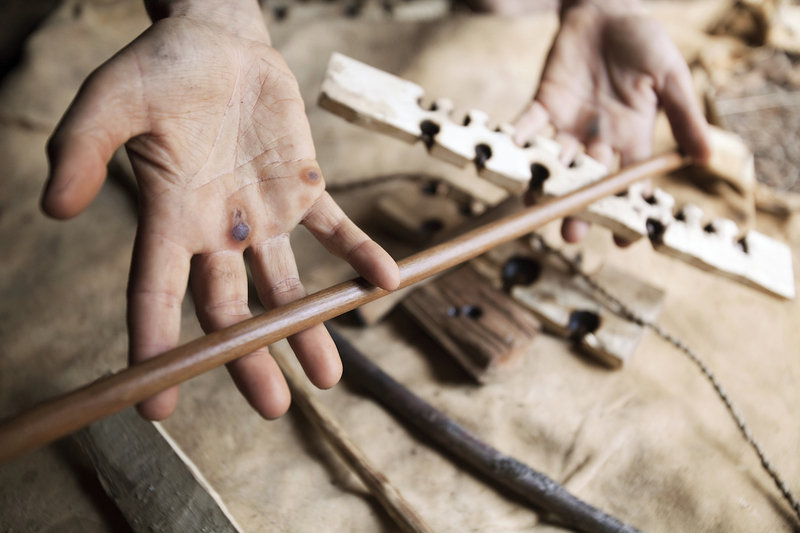 But I often struggled to find that simplicity, partly because we had workshops the first six months and were given this suite of wilderness survival skills, each of which is a lifetime study in itself. So part of me wanted to make the most of this fantastic opportunity to learn how to track, tan hides and do all these crafts - even while another part of me wanted to sit around doing nothing. Time can so easily be filled up. It’s much more of a challenge to un-fill time, to empty yourself of obligations and plans. What was simple about it? One thing I really liked about that year was the simplicity of my social network. I could have ample time alone, which I love, and yet I had these other people that I shared the property with, going through the same thing [each living on his or her own patch, but near enough to be summoned by a loud cooee]. That was actually enough for my social needs, and it has given me a yearning for a life that is very simple, and deeply connected to a small group of people. Did you have much of a culture shock when you left the bush? In hindsight I did. The “four walls” thing was difficult, not sleeping outside, and the shift in priorities. I still wanted to live simply and to be connected to the outside, but I needed to make money, I was thinking about “What next?”, my outdoor time got squeezed into the start and the end of the day. So the culture shock wasn’t really the running hot water or things like that. I just really missed the simple social life, and it felt much more difficult to feel a sense of belonging and safety, and easier to get overwhelmed. How did the year change you? It really shifted my awareness from the head to the heart, towards the eco-psychological and exploring this nature-human psyche relationship. I think we’re in a really interesting phase at the moment, of realising that there’s something very out of balance with our relationship with nature. At the same time, breaking down the sense of who I am has created this fluidity which is great in some ways, because I’m much more willing to go with where the energy is and follow where I’m drawn, but things also feel a lot more groundless and uncertain. Friends are often the best barometer sometimes of how you’ve changed – and they tell me that I am softer and more present and I give them more time, I’m less task driven, more available; that’s the best feedback I’ve had. I think that’s really true, that what we really need to do is come alive to what our passions are, to wake up, wake up our senses – we can so easily be dulled when we live within four walls and on computers, and it takes constant vigilance really to reawaken and to keep cultivating that sense of aliveness. I had that experience of what it feels like to feel really alive in my senses and in my body and I really want that to continue. Any advice for others feeling inspired by your book? I think if people read my book and feel inspired, it’s probably an inspiration to do something that is reawakening and re-enlivening, and to ask: What would that be? If I could do anything… What really calls to me? I do believe we all have a unique relationship to the natural world; my relationship to certain plants and animals is going to be completely different from yours, and if the book spoke to you in that way, maybe it’s time to look at your relationship with the natural world and figure out some ways to deepen and widen that, and look to others with knowledge of plants and skills. It’s a beautiful thing to feel comfortable in the bush, and to spend the night alone, it’s liberating and it’s something that we often don’t have or make time for, so I would encourage that relationship in any way, and work your way up to spending chunks of time… not necessarily alone. Even camping. We’re lucky enough to have national parks all around us. Just pack up a tent, a stove and a sleeping bag and go. And reduce the gear; try to go with as few mod cons as possible. What was your favourite part of the year? I think my time at the sit-spot every morning, and walking and wandering, without time or destination. Being barefoot on the land, wandering around, I can’t imagine anything more joyful, in fact I’m going to go and do that right now. My Year Without Matches: Escaping the City in Search of the Wild was published in June 2014 by Black Inc Books and is available in print and as an ebook. I totally want to pick this up now! can't wait to search around more!